It’s a New Year and I have LOTS of competitions lined up for you, starting with this yummy one with Guittard! To create world-class bakes, you must use world-class chocolate. San Francisco Bay Area chocolate maker Guittard Chocolate Company helps home bakers bring their chocolate creations to life! With a broad tapestry of baking chocolates, this sustainable chocolate company has been expertly crafting its products since 1868, using traditional French methods. The Guittard baking range offers Fair Trade™ certified and organic chocolate in a variety of different forms available from Lakeland, Whole Foods, M&S and Ocado, so everyone can have the very best ingredients for perfectly baked goods. Those on their baking journey can delight in the array of options available, allowing their creativity to truly flow. 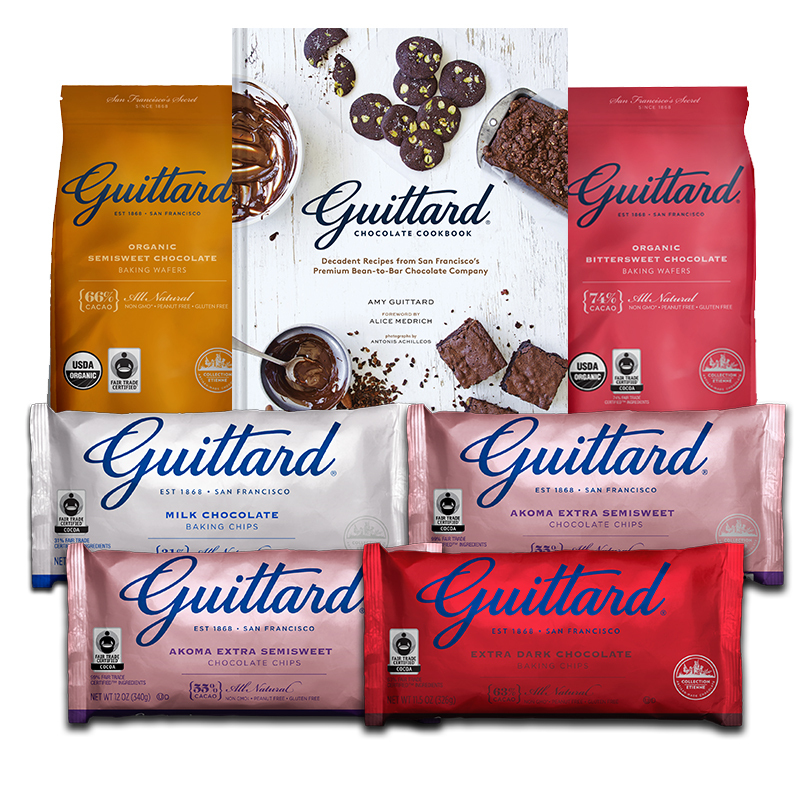 From superbly creamy 31% Maxi Milk Chocolate Chips, which are crying out to be mixed into cookie dough or folded through cake batter, to the intensely dark 63% Extra Dark Chocolate Chips, which can be used to add a touch of indulgent luxury to any recipe, Guittard has an ideal product whatever your bake. Guittard’s organic baking wafers, available in Milk Chocolate 38%, Semisweet 66% and Bittersweet 74%, are ideal for melting down into ganache or buttercream, flavouring ice cream and even for confectionary applications. Their chocolate baking bars, available in 64%, 70% and 100%, create a complex and deeply chocolatey base for best-ever brownies and tarts. I am delighted that Guittard have given me two bundles of chocolate goodies to giveaway! There is one bundle for twitter and one for instagram! So, how do you enter the Guittard Competition? The twitter winner will be chosen at random from someone who follows me @SuzyPelta and @GuittardChoco on twitter and who has retweeted the competition information.There are no limits to the amount of twitter retweets and each twitter retweet counts as a new entry into the competition. However if you are not following @SuzyPelta AND @GuittardChoco your retweets will not count. The instagram winner will be chosen at random from someone who follows me @SuzyPelta and @GuittardChocolate on instagram and who has answered the competition question there. – The competition starts at 10.50am on 15th January 2018. – The competition closes at 11pm on 21st January 2018. – The competition is in no way sponsored, endorsed or administered by, or associated with twitter or instagram. – The prizes will be delivered by the end of February 2018.